Update: This tool is no longer available. I find this freevideocutter be more beneficial to fulfill your requirements. Thanks for your visit. I’m sure you love few scenes from the movie you watched last night and want to share with your friends on social networks but unable to do, as you don’t have any video cutter software installed in your computer. But why install any software and fill extra GB’s when all these things you can do online using Online Video Cutter? 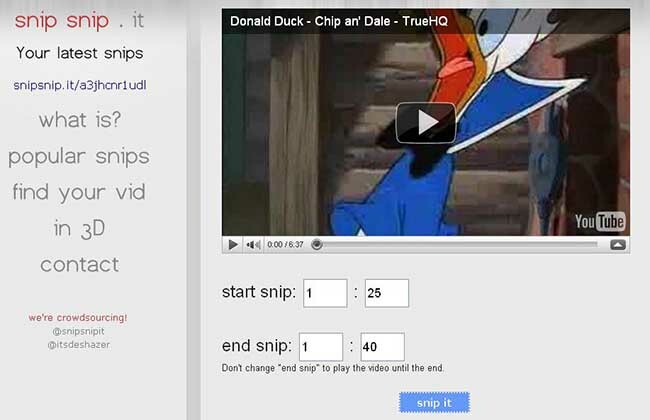 SnipSnip is an online tool, which is only build to help you cut your favorite part/scene from a movie. It is an easy way to share your favorite parts of videos you like. But unfortunately, the service works only with YouTube videos it won’t allow you to snip videos, having with you in your computer’s hard disk. To cut your video you need to visit SnipSnip and there in a box you need to insert a YouTube link to shorten and share your favorite part of the video clip. You just need to mention the start time and end time of the scene you want to cut from that video clip in start snip and end snip box. After that, application gives you a link to watch and embedded HTML code to share on your blog or site and also snipped link so that you can share on facebook or twitter too. All you can do is for free this application is totally free for all internet users so enjoy using their service. Comments are welcome! Please do share this article if it may have helped you in any way! Also Like – Facebook & Follow us – Twitter to get connected.